Little Red Cyrano — SPORK! 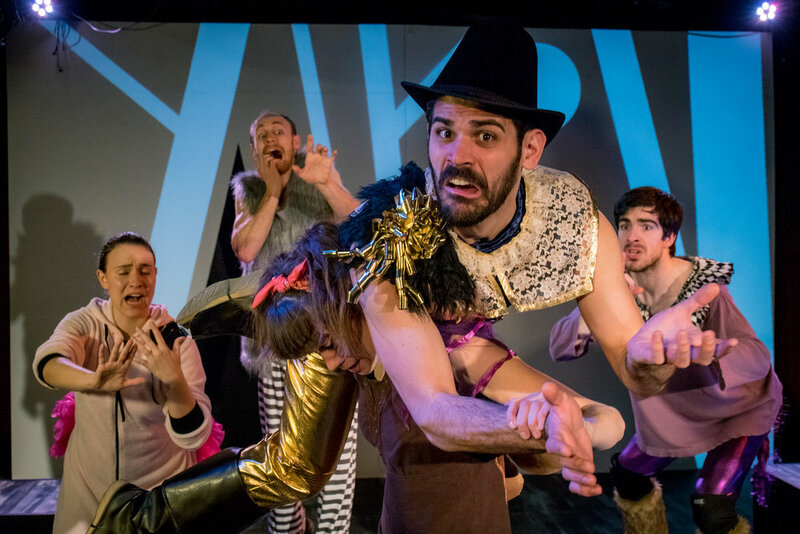 Little Red Cyrano is a sprightly jumble of concepts and whimsical notions baked into sweet, if not a little tenuous, confection. It’s a visually stunning, unusual experience, serving an often neglected deaf audience in ways that are completely oblivious to hearing audience members. As a hearing theater-goer with very little grasp on ASL and unspoken shorthands utilized by the creative team, it was a joy to learn that the things I assumed to be physical flourishes were actually storytelling tools. 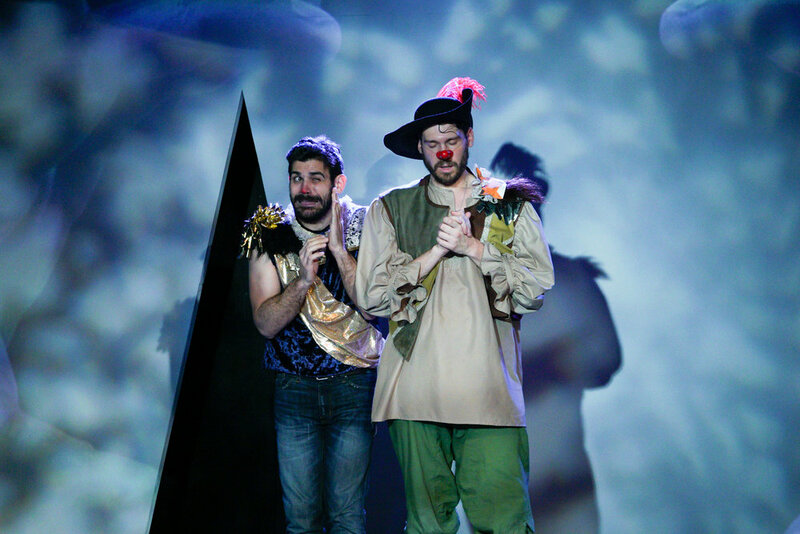 The concept, staging and activism built into Little Red Cyrano are worth the price of admission, even if Red Theater doesn’t achieve the perfect literary mashup. This bit of folklore begins in a distant dystopian future that pits a tribe of woodbound human-animal mutants against a dark, unseen enemy, the New Patriots. The people who inhabit the Deaf Woods serve under an enigmatic leader, Grandmother (Michael J. Stark), and her followers seem to volley between lusting for murder and innocent forest clowning. Don’t worry too hard about any of this, though; the heart of this story is the mixing of two tales you already know and love. Handsome new recruit, Christian (Dave Honigman), enters the picture and his nice physique and demonstrated heroism make up somewhat for this character’s artless signing ability. He wins over the woodland mutants instantly, except the whip-smart military marvel Cyrano (Benjamin Ponce), who shreds Christian to smithereens with well articulated poetry from his hands. Cyrano has the usual distinguishing feature, and this time it’s a big red clown nose filling him with self doubt. However, it’s when Red (Dari Simone), a sharp mutant who makes Cyrano feel less alone, confides her burgeoning love for Christian, that things go pear-shaped. Cyrano channels all his unrequited love into turning Christian into the man of Red’s dreams, and helps his rival by bombarding Red with love letters- not written notes, but characters in the ASL lexicon. Their little forest enclave gets eaten alive as a result of the trio’s bottled up tension. Literally. After all, you can’t conjure up a Little Red Riding Hood and neglect the big bad wolf. There’s a lot going on in Little Red Cyrano. There are so many more plot developments, characters and other minutiae that may not be spared on stage, but can definitely be spared here. Author/co-director Aaron Sawyer and director Michael J. Stark have worked hard to create a world for these characters to inhabit, but there are two things drawing us in with greater success: a familiar story performed well by an apt cast, and ingenious methods of enriching the experience through signing, sound, and opinionated captions. The three legs of our love-triangle do an amazing job in unspoken character conveyance. Dave Honigman brings dingbat energy to Christian, who has no idea how hopelessly lost he is in language. Dari Simone makes her acting debut as Red, and she strikes such a strong, imposing visual stance, it’s no wonder she has two men trailing at her heels. Benjamin Ponce is the quintessential odd duck as Cyrano; he is a soup can that has taken great pains to hide it’s label from everyone, but he’ll have to show his chicken and stars sometime. The technical components of this production deserve accolades all their own, because no stage element is not without function. Everything artful serves a purpose; like projections of hands signing words that take on the characteristics of our scene location in the woods, or at the bakery. In any other show, screen captions would stick to the script, but even the monitors relaying dialog to us go about it with unique personality. Also, knowledge of ASL is not a prerequisite. Think of this as an immersive introduction to signing. When Cyrano privately tries and fails to bring his two ‘alone’ index fingers to form the signed word ‘together’, it’s a little game of “she loves me, she loves me not”. There’s no need for spoken poetry when the word for ‘leaf’ springs from a line of Cyrano’s profession of love, to lilt its way to the ground. Red Theater has made a step in a very compelling direction with this production and I hope it’s the beginning of a new theater tradition.